Whether they’re made to be creamy or brothy; sweet or savory; fiery or mild, all chicken curries are fragrantly spiced. Here are eight takes from around the world. Chicken curry isn’t a single dish but a category. Whether they’re made to be creamy or brothy; sweet or savory; fiery or mild, all chicken curries are fragrantly spiced. Here are eight takes from around the world. British cookbook author Nigel Slater makes his own incredible curry paste, which makes his dish extra fragrant. Australian chef Neil Perry created a simple version of this sweet-and-spicy Malaysian curry. 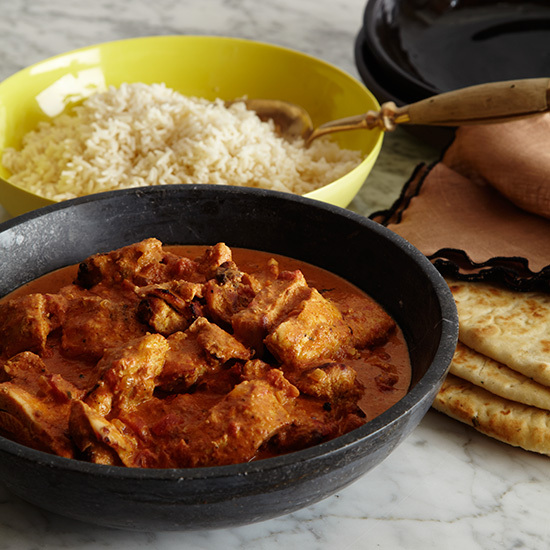 Enriched with yogurt instead of heavy cream, this tikka-masala style chicken curry is a bit healthier than the original. For a more classic version, try this recipe. This South Indian-style coconut curry gets its heat from the black pepper. This Muslim-Thai curry is spiced with sweet five spice powder and simmered in a tomato-coconut broth. After being marinated with a delicious lemongrass-curry paste, chicken thighs cooked in a fragrant coconut broth for this Malaysian dish. For a faster version, try using bottled red curry paste. Chicken curry becomes a comfort food dish when made in the slow cooker with sweet madras curry powder, potatoes and cauliflower. Bananas sweeten the curry sauce for this chicken while this West Indian curry gets its heat from pickled chiles.